It’s no secret: we live in the world’s most breathtaking country. From striking mountains and bubbling rivers to lush forest and white (and black!) sand beaches, New Zealand has it ALL. To capture the true beauty of our incred country, Samsung teamed up with photographer Rambo Estrada. Based in Mt Maunganui, he has built a 100k+ following by documenting New Zealand’s beauty. Seriously, his Insta is stunning. On his epic road trip, Rambo shot the country’s most Instagrammable places with the Samsung S8 and Note8 phones. He put the dual lens camera to the test, capturing stellar shots—regardless of the available lighting. Want a phone of your own? (You do). Tag #samsungshotlikeapro on your fave Instagram pics shot on a Samsung and cross your fingers Rambo judges yours as the best! Entries close March 31 at 5pm. To give you some gramspriation, here are his top shots and spots! Located on the Coromandel, Hahei is a tiny but mighty beachside town (is it even big enough to be a town?!). The spot is known and loved for its stunning pink shell beach and protected marine reserve. It’s also a hop, step and a jump from world-famous Cathedral Cove (it featured in The Chronicles of Narnia and a Macklemore vid!) and Hot Water Beach. Visit the cove by embarking on a scenic two-hour return walk, taking in views of Gemstone Bay along the way (and yes, it’s as pretty as it sounds). Finish the day with a locally brewed craft beer from The Pour House—paired with house-made pizza, of course! Mt Maunganui (better known as The Mount) is a total summer hotspot. Actually, to be fair, this beach town pumps all year round. Boasting the best of both worlds, the peninsula has a sheltered bay on the harbour side and an outstanding surf beach on the ocean side. At the very tip of the beach you’ll find the town’s namesake: Mt Maunganui. Walk around the 3km base track or climb to the summit (it will take you around 1 hour 20 minutes). 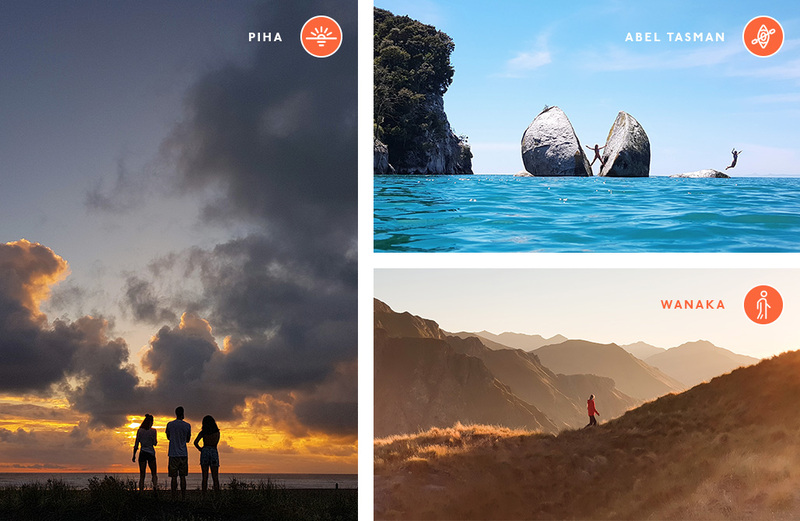 From here, feast your eyes on breath-taking, 360-degree views of the Bay of Plenty. Double points if you’re up there for a picture-perfect sunrise or sunset. Regardless of when you visit, Wanaka will always impress. Surrounded by staggering mountains, the town sits proudly on the edge of Lake Wanaka. With Mt Aspiring National Park a stone’s throw away, it’s the ultimate base for skiing and snowboarding over the winter months. You’re also spoilt for choice with countless walking tracks to explore, including popular Roys Peak Track. Climb through alpine meadows and grasslands for breathtaking views of Lake Wanaka surrounded by snow-capped mountains. And remember: pics or it didn’t happen. Land meets ocean in the most glorious way at Abel Tasman National Park. We’re talking golden sands, crystal clear water and lush native forest. You’ll also find Cleopatra’s Pool—a natural rock pool with a moss-lined waterslide. Explore the picturesque National Park by foot or water. The Abel Tasman Coastal Track is classed as one of the country’s ‘Great Walks’ and takes between three and five days to complete with huts and campsites along the way. Alternatively, jump aboard a water taxi and enjoy a day trip or opt for an overnight kayaking trip. Looking good, New Zealand! 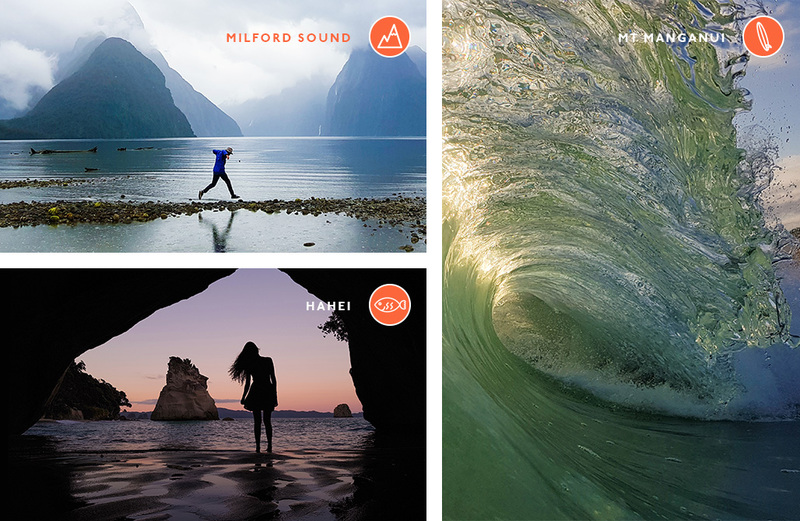 Let’s be honest, no round-up of beautiful Kiwi spots would be complete without mention of Milford Sound. Carved by glaciers during the ice ages, the fiord showcases jaw-dropping views in every direction. Picture sheer cliffs with cascading waterfalls (some as high as one-kilometre! ), plunging into the dark waters. If you’re lucky, you might manage to catch a glimpse of Mitre Peak, a striking mountain on the shores of Milford Sound. But don’t be disheartened if it rains—the waterfalls are only more remarkable. Take in the beauty of the area with a boat cruise (you can even stay overnight) or sign up for a kayak tour or scenic flight. As part of the city we call home, you’ll find Piha surf beach. Less than an hour’s drive out of the hustle and bustle of Auckland’s CBD, the West Coast gem is the ultimate escape. Wriggle your toes in the iconic black sand and take in the beauty of the rugged coastline and spectacular surf. While Piha hums with beachgoers over summer, be sure to visit over winter to take in the moody and mysterious beauty of the beach. FYI it’s never too cold for an ice-cream! This is the West Coast at its finest. Explore the beauty of New Zealand and capture all your picture-perfect moments with Samsung Galaxy Note8. Editor’s note: This article is proudly sponsored by Samsung and endorsed by The Urban List. Thank you for supporting the sponsors who make The Urban List possible. Click here for more information on our editorial policy.